Happy Monday. Hope all you sweet mom's had a great day yesterday. I traditionally start to plant my summer flowers on Mom's Day. This year I was a little hesitant to do this with the harsh winter we had and how late all the spring plants have been. The people at the nursery where I get my flowers assured me it was safe to start to plant. I am such a summer girl and love my flowers so I got a good start yesterday. Boy my back and knees are telling me today how old and out of shape I am LOL! Here are some pictures of the front garden start up. There will be more tweeking and movement but at least I got a good start. The pictures are not real bright as it started to rain last night and is very cloudy today when I took these pictures. I am doing a yellow, white and blue color scheme out front this year. Got my old chippy window box planted and a hanging basket and pot for on the old bench. I need to find another cute garden hat or watering can to add to the bench. I also need to find my blue gardening boots from last year. I think I need to still dig in the shed. Anyway it is a start out on the porch. I hung this old garden door hanger. Need something cute like old garden tools or a cute straw hat to hang on this hook. 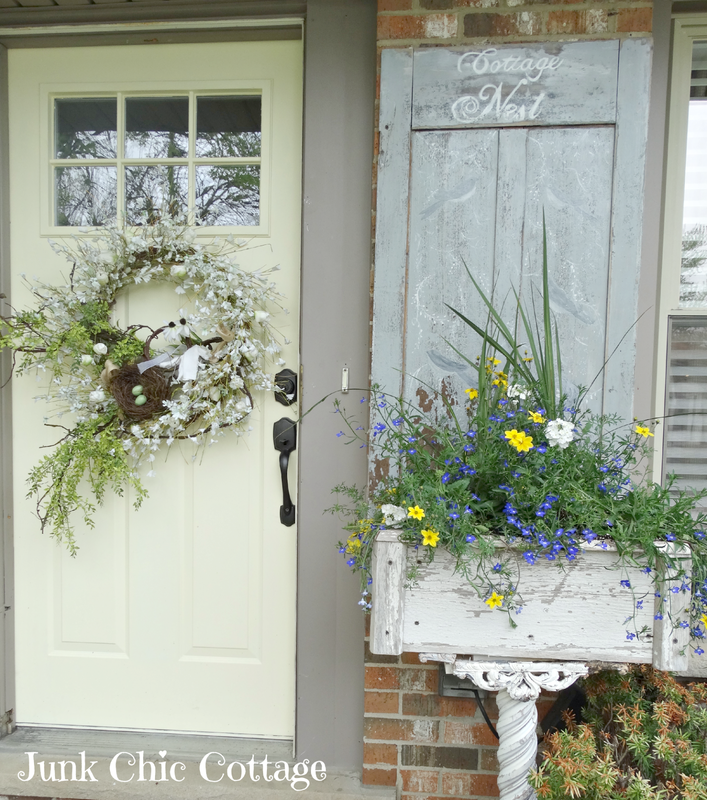 I know it comes as no shock that I have this old vintage cottage nest door out in the garden. Gotta love a door in the garden decor. 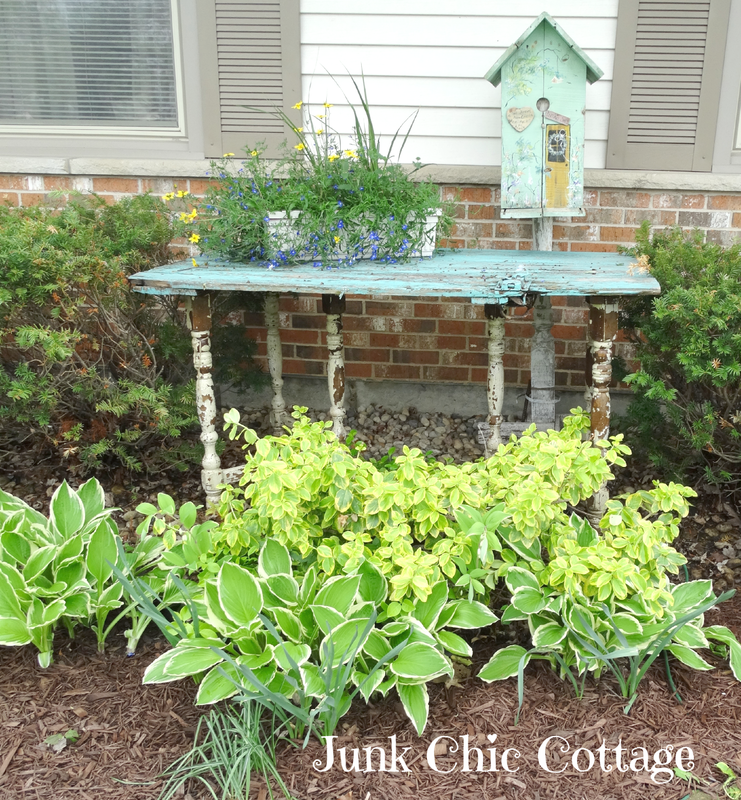 The old chippy wood box is a planter and it is stable on the old porch post. She got a paint job and has been moved to the front yard tree and flower beds. She will be getting more gussied up with a basket put on the back of the bike. I have my old potting table out in the front garden. Love this chippy ole girl. I can't wait to add my planting pots and garden tools to this table. It is a fun decor feature but it is also very functional for planting. I put my old hand painted garden bird house behind her. There you go it's a start. Lot's more decor additions and more flowers to come. I will post more as I fill in and the garden start to take. It just felt good to get a start on the summer garden. I have been working on the backyard too. 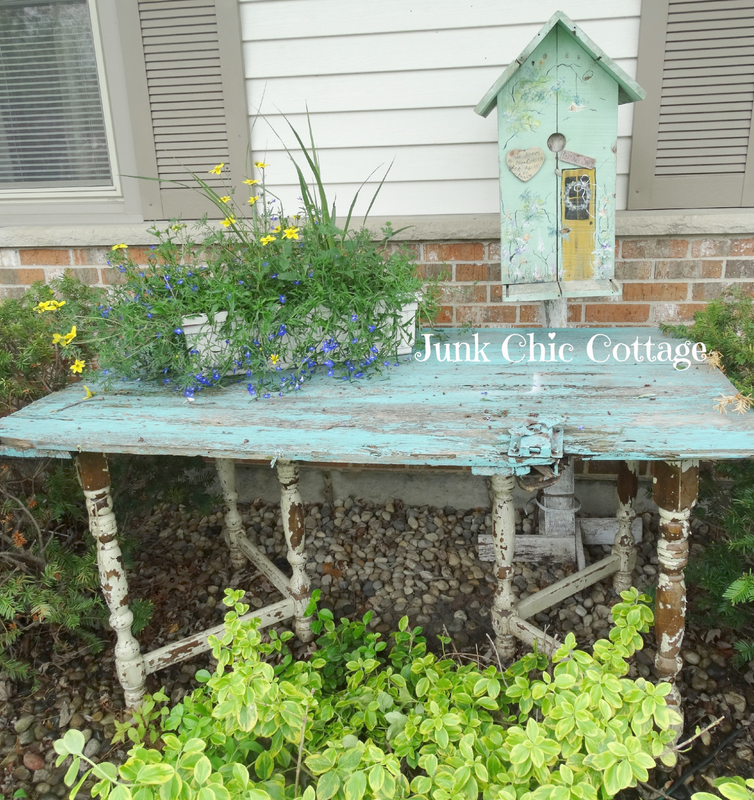 I am adding more vintage architectural pieces out in the back garden. 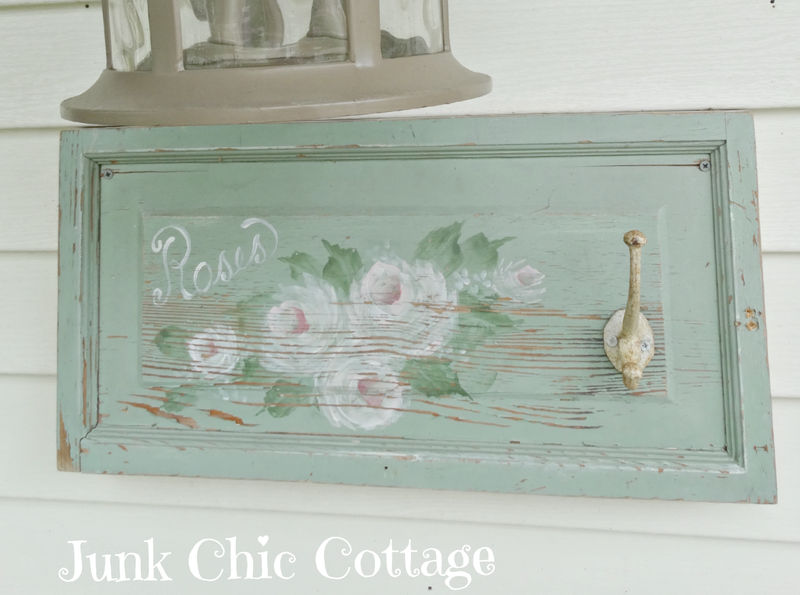 I love when I can mix old vintage pieces in with the flowers. So happy we are starting to see nice weather here in the midwest. Hope your week will be a good one. Love your blue, white & yellow combo, Kris. I also love how you say "need" - it's not about need, silly! Your perennials are lookin' good too. I am taking my time on containers - once they're in, it's never-ending on the constant care. Hopefully by Memorial Day I'll be more ready. RIght now I'm patching in grass, and watering that is a pain - my patches are too far away from the hose bibs. Making things look pretty takes a lot of work, doesn't it? And a lot of Advil, lol! Have a great week. Loving all that blue. I love the bike basket overflowing with flowers. Very pretty, Kris! I know all these flowers will be looking abundant and overflowing in a few weeks with your green thumb! : ) I have started planting here in Ohio, too. I'm going with some purples, blues and whites this year. 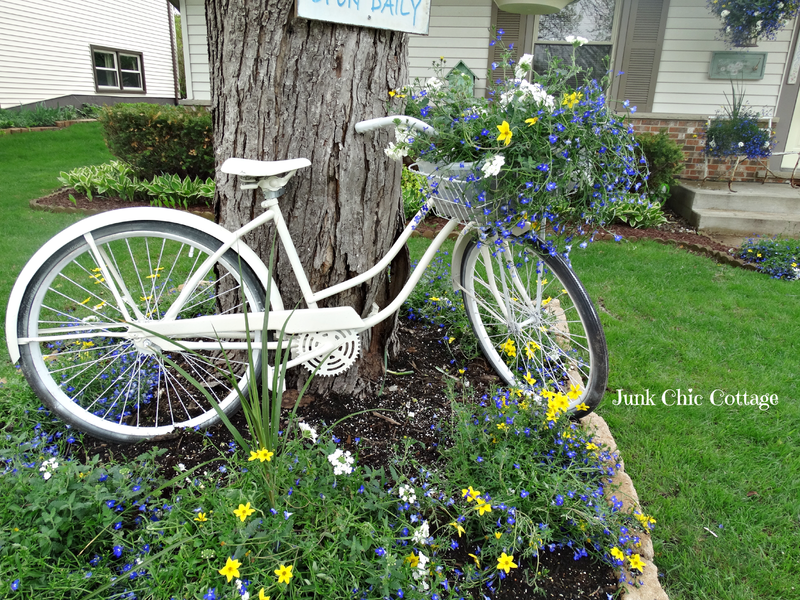 Oh your yard looks fabulous and I adore that bike. So pretty and the flowers are just the right colors. Beautiful already! Is the blue lobelia? 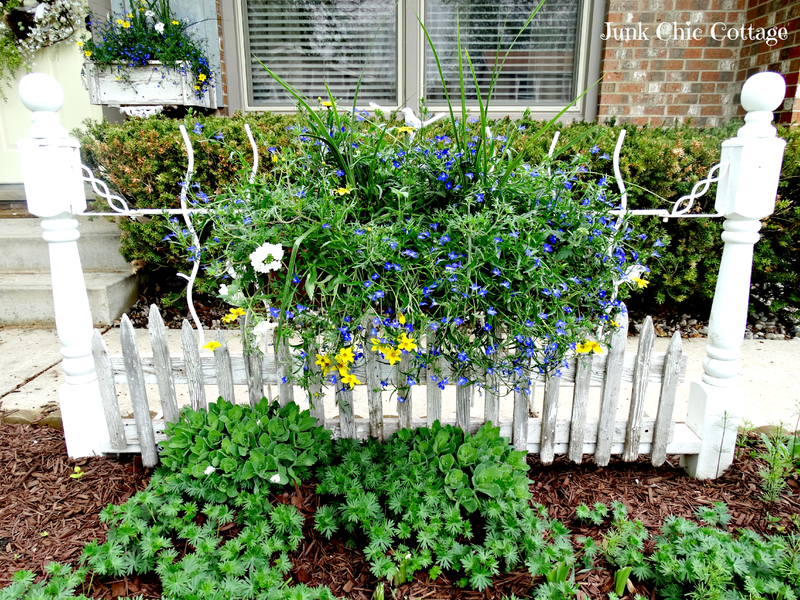 Where in the world do you buy hanging baskets that large or did you make it up? Looks so pretty-don't know what you could do to make it more attractive, but bet you'll think of something. Your yard is always a visual delight! Beautiful Kris!! Love all those vintage pieces! Looking so pretty! I've been slow putting out flowers this year too. I love it all! I am just beginning to get things started here.. I am like you...the weather had me a little afraid..but, I know after Mother's day is always a safe time. I have an old bike too. I am going to repaint mine blue...lol.. It all looks great! Happy Flowers everywhere! Blessings! You are off to a great start! It is looking beautiful! I love the bike! Oh Kris how inviting your gardens look. I can almost feel your hug and a glass of lemonaid as you walk me around your summer flowers. Your displays are so creative and flowers are a very pretty color scheme. Kris, your yard is precious. I hope to find a bike of some kind soon!! Gorgeous Kris! You really did get a good start. It's been cold here the last few days and I had to bring all of the flowers I brought indoors. They said Weds. is our 'go to' plant day. Holding off but I am chomping at the bits! Have not talked to my hairdresser yet. Planned on swinging by her shop but haven't made it there. I am going to text her right now about the garden gate note post and I'll let you know. it looks beautiful, kris:) LOVE your potting table! and the rose painted door is too sweet! have a good week! These are pictures from this year? It already looks so nice. I love the colors and the hanging basket. The bike, the table and all the little touches make it so sweet and cozy. I like that word cozy, hah. 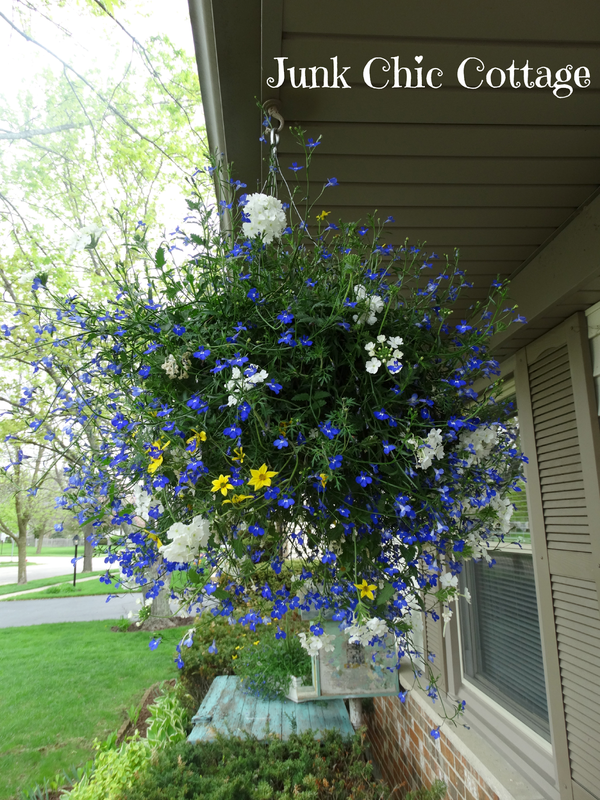 So far I hung the hanging basket that my husband got me yesterday and carried my plants outside that need potted. You are way ahead of me. Can you drive a little south and help me, hah. Wow girl you sure did a lot of work. I see your changed your color theme for this year. I love the combo of flowers. Our prediction is for snow possibly next week so my planting is nonexistent so far, all but 2 cherry tomato plants. Your place is looking beautiful like always. I can't believe how expensive all the annuals are and if you like a nice full look it is very costly. Everything is so pretty Kris and I can hardly wait to see all that you will be planting. I went on a garden tour week before last and had a wonderful time. I think you would like one of the gardens we saw with all the olden things in it. It was on my last post. I got so many ideas now just to get them executed into the yard - time will tell. how was your girl friend weekend - get any great treasures? Loving the blue, white, and yellow theme for this year...so very pretty!! It looks lovely. I really like you garden door hanger, and your potting table. Your colour scheme is great. Sunshine and showers here, so good for the garden, bad for my hair! So pretty Kris! the color combination is so cottagey. 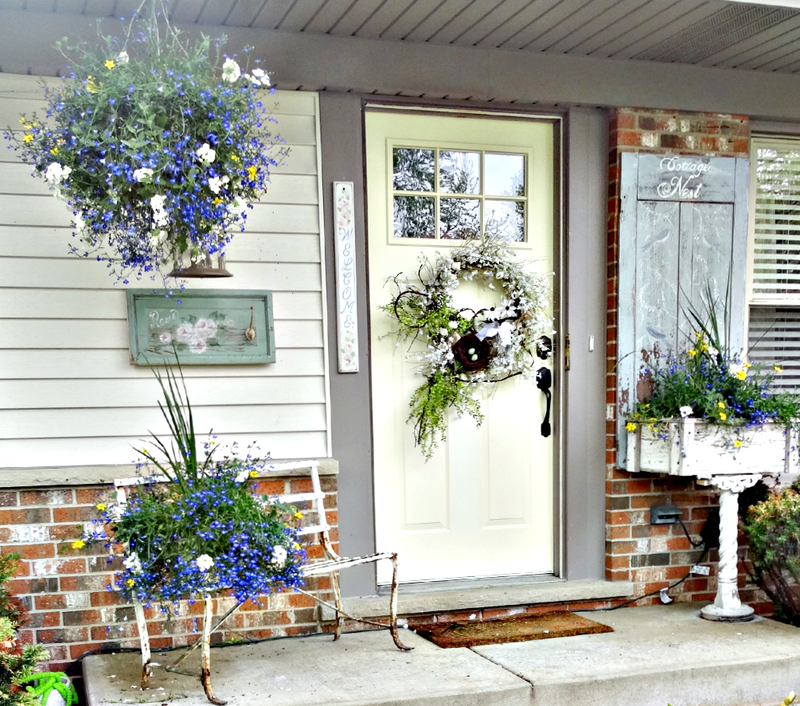 Do you put together your hanging baskets or buy as is? Kris, I love love love your gorgeous blue and white flowers! And that bike!!!!! FABULOUS! (as usual) Don't you get people coming and asking to 'rent a bike' with that sign outside, or is that a little side line of yours Kris? 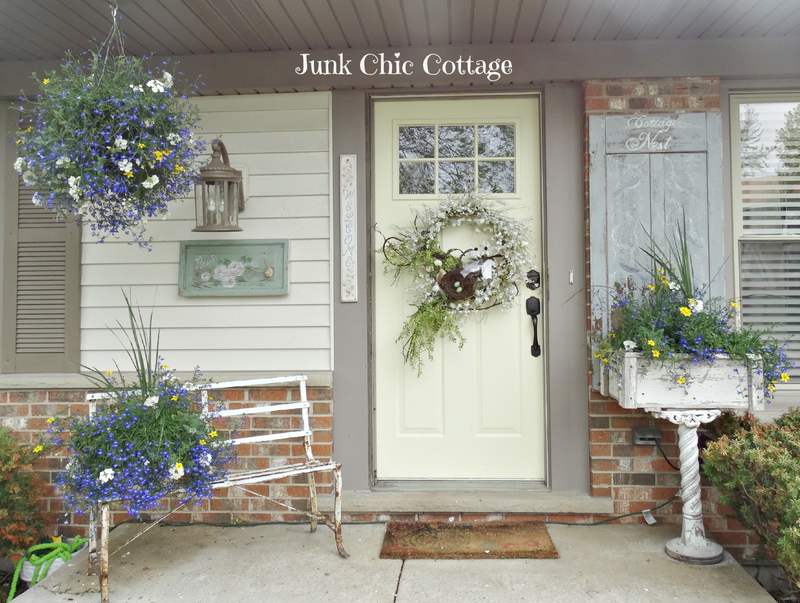 Love, love, love your gardens and porch....and you had me at "bike rentals"....love that you painted the bike white....your flowers and plants are doing so very well after such a long and harsh winter...beautiful, beautiful Kris...I just love the way you incorporate such great vintage items in your gardens! I am so happy to see your bike painted white. White is my favorite colour. Love the bike prompted up under the bike rental sign. Your neighbor next to you needs to take some yard decor advice from you? They must drool over your creative gardens, I know I sure would if I lived next door to you. The garden beds look sweetly beautiful. As does the back drop of your home. Always thankful for your visits. Oh my goodness...I love your home! its so full of charm and so is your blog. I just found you and so happy I did. What beautiful colors you've chosen this year Kris - just love them - the bike looks perfect - and I see you have your " summer " door up! I was just thinking to myself what a treat it must be for the neighbor's to look out and see your home ! It's exciting isn't it - to feel summer in the air? Can't wait to see your deck ! My goodness! Your flowers are so full already. They're beautiful! You really DID get a head start. Love the blue, yellow and white color scheme you're using too. I bet everyone in your neck of the woods is loving this warmer weather now! 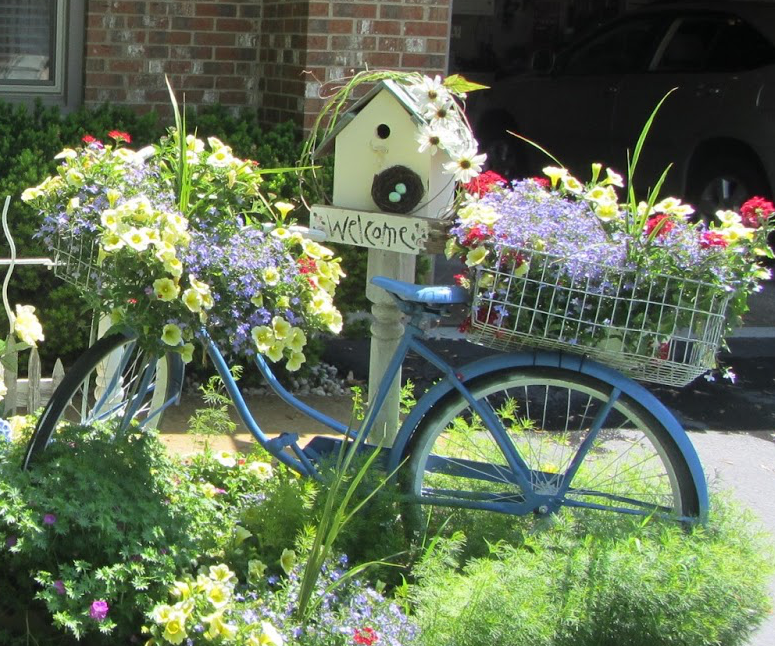 Always love a bicycle basket full of flowers in front of a yard or in a flower garden. So cute! Blue, yellow and white are some of my favorite colors to put together. Your flowers are bountiful and so pretty! 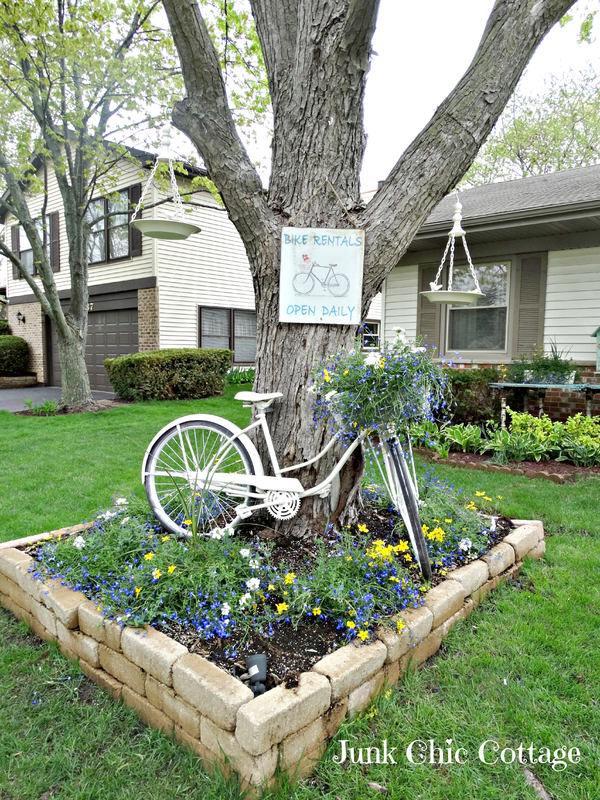 i love the way you used the bike in your flower bed! i did my planting this weekend, too. i love the colors that flowers add to a space, don't you? Can I just say GORGEOUS, you do an amazing job with everything you touch. I live vicariously through you, LOL. Love the bike and your flowers look so full already I can't imagine in a few months. I love my hub by dearly but he always bugs me when planting my containers, saying you are crowding thing out and they will have no room to grow. I get so frustrated at times. Your flower garden is just amazing!!!!! I may have to borrow your potting table idea.....so cute! That bike is the prettiest darn thing Kris!!! Your flowers look so beautiful, It's been raining so much here in Alabama that I'd need a row boat to go outside to plant anything! Maybe I could do water lillies????? Love the white painted bike, Kris! Your pretty, chippy things combined with all the greenery and flowers is such a lovely mix. If this is just your "start" I can't imagine how beautiful it will be later on! It must be amazing to finally be able to set out all your garden items. I leave most stuff out year round and cannot imagine having to set things up all over again each spring. Have a great time in Florida. Beautiful, Kris! Love that Lobelia blue, and your chippy antiques mixed in.